John Broz questions himself all the time. Although Broz has been involved in the sport of Olympic weightlifting for 36 years, he sometimes doesn’t feel as qualified as he’d like. “I never stop learning,” Broz said. Nicole Carroll is CrossFit Inc.’s Director of Certification and Co-Director of Training, and it goes without saying that Carroll expects CrossFit coaches to constantly seek new knowledge and continually stay up to date in their coaching. For Carroll, certifications, certificates, diplomas and degrees represent an element of basic competency, and continuing education builds upon that foundation. CrossFit’s credentialing program follows this model. 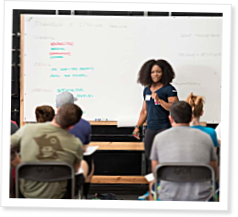 Although the Level 1 Certificate Course lays a solid foundation for becoming a CrossFit coach, it was never meant to be the end of the coaching journey. After the Level 1 Certificate Course, many trainers go on to take the Level 2 Certificate Course (CF-L2). But beyond the Level 1 and Level 2 courses, Carroll is most excited about CrossFit’s newest credentials, the Certified CrossFit Trainer (CCFT/CF-L3) and the Certified CrossFit Coach (CF-L4). What makes the CF-L3 credential unique is its continuing-education requirement. After passing a test, those who earn the CF-L3 credential must complete 50 hours of continuing-education units (CEUs) and 900 coaching hours over the course of three years in order to retain it. “The goal is ... to encourage them to embrace learning in all areas related to their profession,” Carroll said. Ute CrossFit’s Bobbie Jo Hackenbruck develops a program to rehab injuries and keep members happy. Emily Beers explains. I like this article. One thing that always comes to mind is Dr. Romanov's opening lecture at the Running seminar I attended. He asked us two favors: 1. accept ourselves as students, and 2. accept him as a teacher. While this seems obvious, it really hit home with me. We were all coaches, businessmen, etc. outside of the clinic. But when we were there, taking the mindset of a student was crucial to the experience. In the likelihood you don't want to read my ranting, just embrace the student mentality (you know nothing) and it will make any clinic experience better.